« Healthy Life Seminar: Wisdom Teeth – Not That Wise! 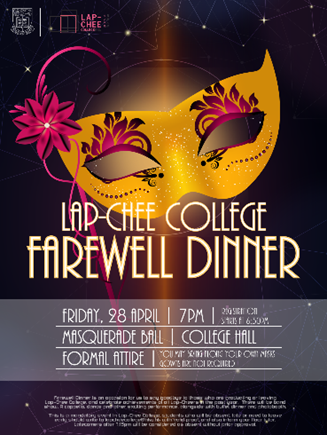 Please be reminded that the coming Lap-Chee College Farewell Dinner will be held on Friday, 28 April 20167. The theme will be MASQUERADE BALL. You are welcome to wear your own masks while we will have limited amount of decorated and blank ones provided. It will be a night filled with music, dance, performances and joy, and will be a night to be remembered for all. Apart from performances and buffet dinner, there will also be graduate speech, presentation of certificates of appreciation, floor photos and big group photos. As this is a compulsory event in Lap-Chee College, students who will be absent, late or need to leave early due to classes should write to lapcheecollege@hku.hk with valid proof, and also inform your floor tutor before Monday, 24 April 2017. Time: 7:00pm (Registration starts at 6:30pm) Latecomers after 7:15pm will be considered as absent without prior approval.